Low clouds blanketed the sky the day I drove Highway One to its northern-most reaches on the California coast. It’s a lonely two-lane road that winds along windswept cliffs while frothy waves crash against the rocks below. 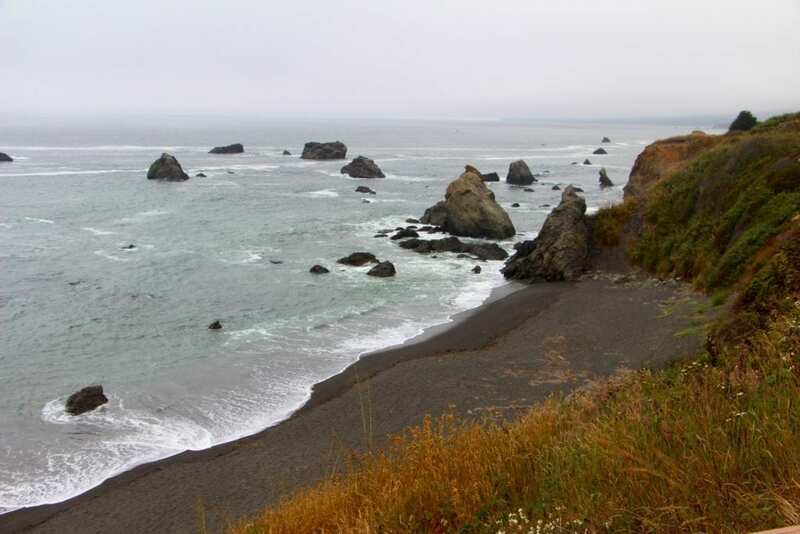 The seaside hamlet of Westport, with a population of just 60, is the last town before the highway turns inland, twisting and rising through redwood-forested mountains to terminate at US 101 near Leggett. Westport is mostly a passing blur for drivers who make it this far north on the legendary highway. It’s sometimes a jumping-off place for Lost Coast backpackers. It also happens to be home to a handful of souls who embrace the solitude on this far-flung edge of the earth. I stopped to stay at the Westport Hotel for a night and like many guests passing through, I wished I could have stayed longer. 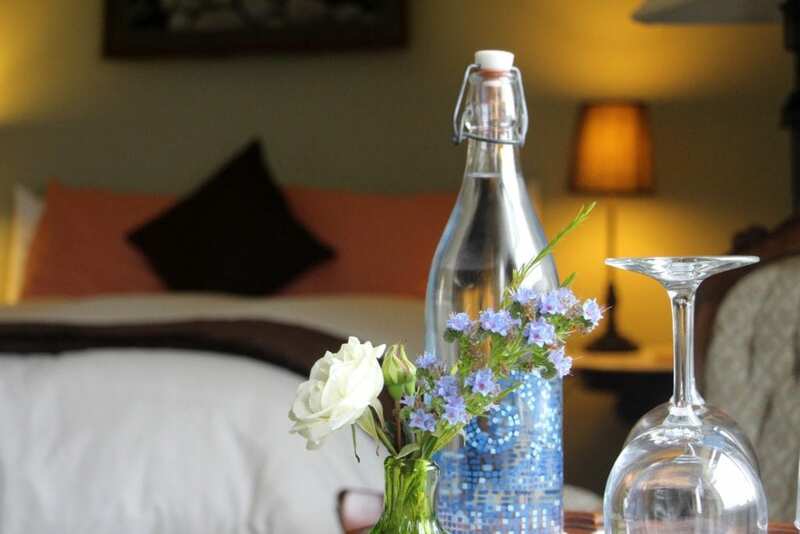 Built in 1890 and handsomely restored, the six-room inn is an unexpected gem on Highway One. 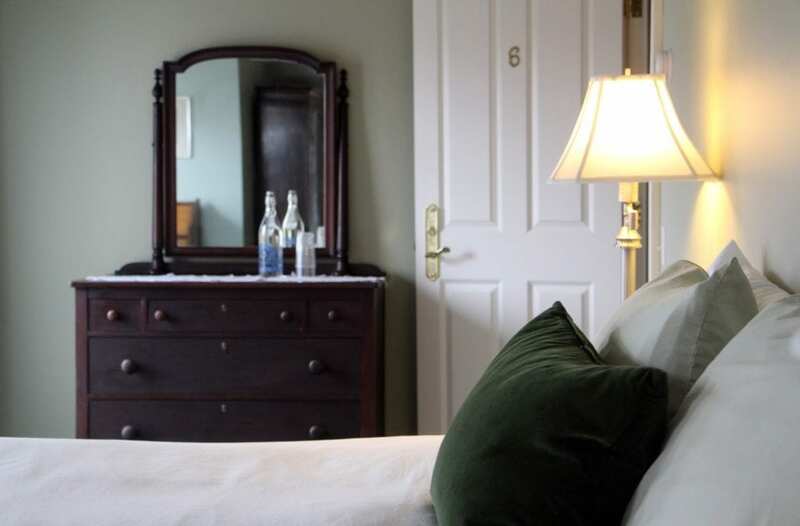 When they bought the inn seven years ago, the owners, Lee Tepper and Dorine Real, sought to preserve the Victorian architecture and recreate some of the character had been stripped away over the years. But they also sought to create airy, light-filled rooms that would appeal to a modern aesthetic. 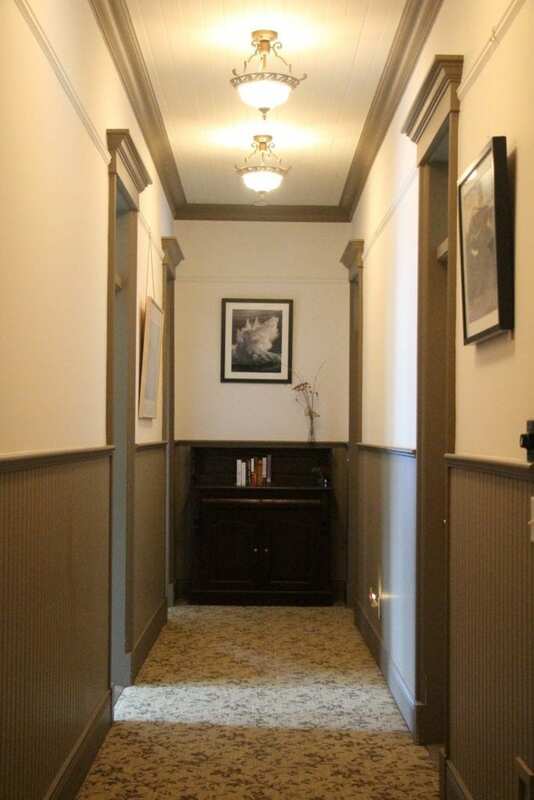 The care they took with restoring the inn is evident in the details. The transom windows above each of the guest room doors feature swirl-pattered frosted glass. The tall windows and doors are trimmed in period-perfect woodwork. The rooms’ high, beadboard ceilings are edged with white crown molding and offset with smooth walls painted in soothing, natural colors. The private baths feature beadboard wainscoting, beautiful tile work, and textured glass shower doors. 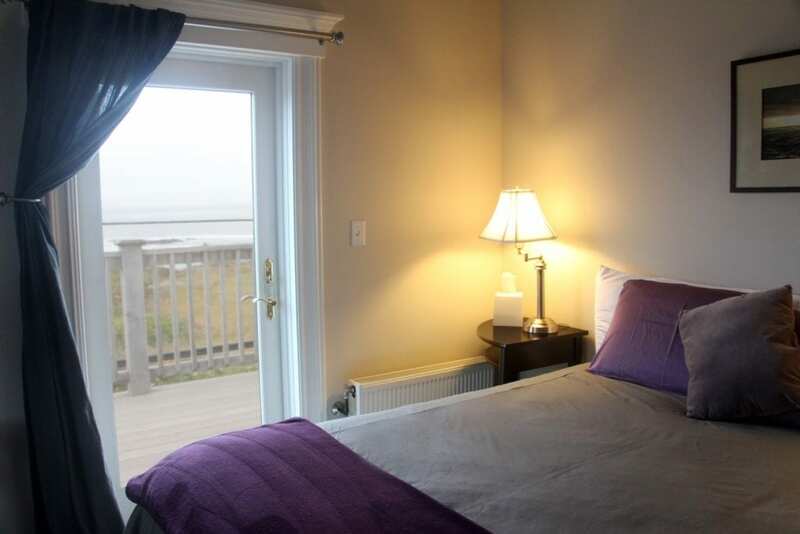 The room I stayed in, Rose, overlooks the ocean and is awash in muted shades of gray and amethyst. The gray duvet cover and throw pillow are offset by soft, violet pillowcases and a plush, plum-colored blanket. The pale gray walls are paired with coastal photography in black frames with white matting. Burnished silver lamps and sconces are topped with elegant white shades. White subway tile lines the walls of the shower, while the shower floor and bathroom floor are finished with hexagon tiles in muted violet hues. The room features an antique armoire and a small table with a single doily in a gentle nod to the building’s Victorian heritage. 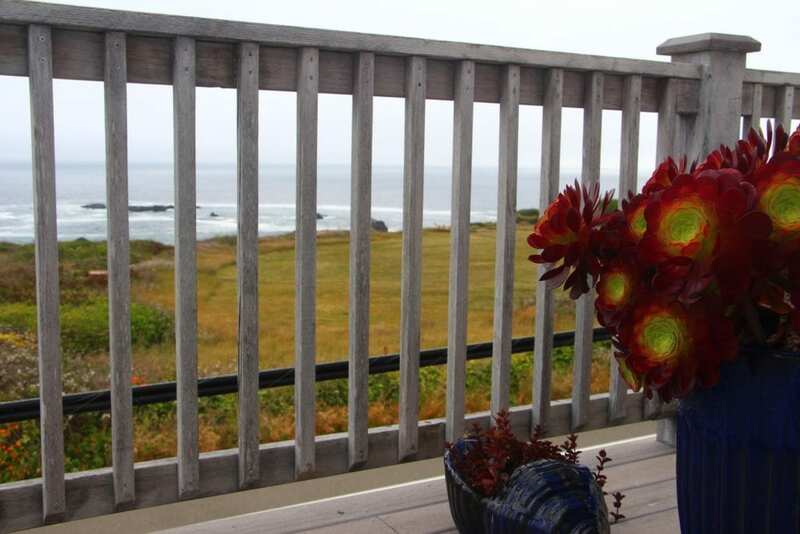 The best feature, however, may be the balcony with its views and sounds of the surf. Later that night, I sat on the balcony and watched the gray sky slowly fade in the darker gray of the sea until the two became indistinguishable. The air was still, and even the ocean seemed languid. For a long time, I could still make out the silhouette of the headlands and the rocks and the slow, undulating ribbons of white sea foam. Not long ago, the hotel restaurant, the Old Abalone Pub, was a lively destination serving the only dinners for miles. But the chef recently left. The owners have been looking for a replacement, but for now, the restaurant and its long wooden bar is dark. For dinner, guests of the Westport Hotel currently have their choice of driving 15 miles down the coast to Fort Bragg or walking next door to the small country store, where they make great sandwiches and pizzas. I lucked out during my stay and was treated to homemade posole. Real had hosted a League of Women’s Voters luncheon earlier that day, and her husband had made posole with cornbread for the occasion. The leftovers were delicious. Back then, the restaurant was called the Cobweb Palace. It had a full bar, but the pub’s license depended upon serving food. The owner’s only direction to them was to “just offer food,” and so they did. Tepper and Real later moved on to other work, and the hotel and restaurant has changed hands and names a few times since the 1970s. 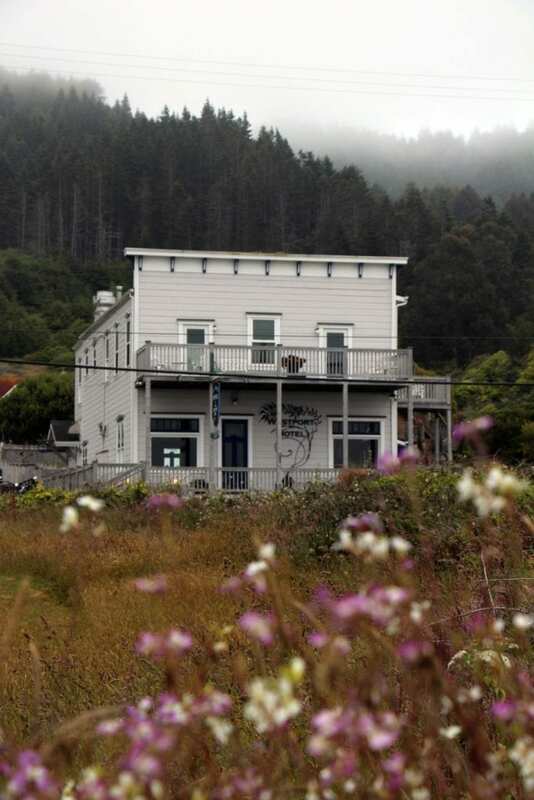 After the Cobweb Palace, it became the Pelican Lodge, and later, the Lost Coast Inn. 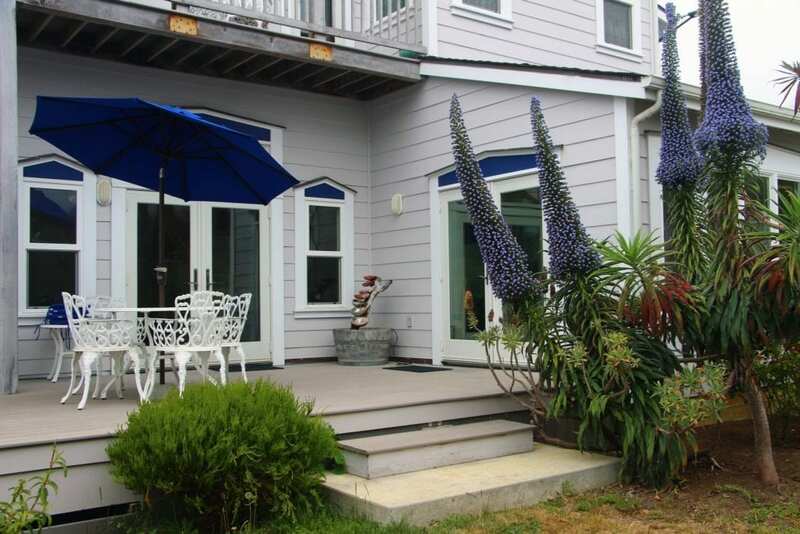 When the inn went back on the market in 2004, the realtor was trying to sell it as a vacation home. She was eyeing the windbreaker and wool cap hanging off the back of my chair. I had planned to go explore the headlands and hidden beach across the road after dinner. The woman explained that the four of them were from the East Coast. They had flown to Los Angeles, where they had rented motorcycles, and were riding up the coast to Oregon. She said the trip had been amazing, but that tonight she was cold. The others came back in better spirits with bags of loot from the store: wine, beer, chips, and dip. They had also ordered a couple of pizzas. One of them opened a wine bottle with a loud pop. I walked across the road to the grassy headlands looking out over the ocean. All was quiet save for a couple of sea gulls. At one point, I watched the young shopkeeper from the country store trot over to the inn carrying two steaming pizza boxes. I crossed a small bridge where wild fuchsias were growing in mass and then down a set of stairs to an empty beach where a gentle tide was lapping at the shore. When I came back, the inn felt warm and cozy and smelled of freshly-baked pizza. 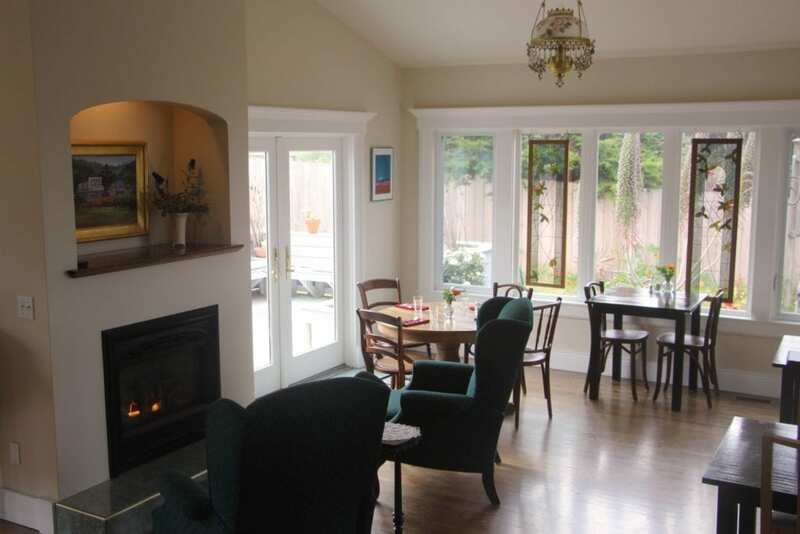 The two couples were seated in the dining room next to the glow of the fireplace. The debris from their dinner was scattered across the table: empty pizza boxes, empty beer bottles, empty wine bottles, opened containers of half-eaten dip, and bags of chips. Their conversation had drifted to dessert and they were mulling going back to the store to get cookies or possibly even a giant cinnamon roll. I went back upstairs enjoy a bit of time in the sauna and then back to my room to watch the sea. In the morning, a pot of tea, fresh fruit, and a warm scone with butter and jam were delivered to my door on a silver tray with a fresh cut dahlia. 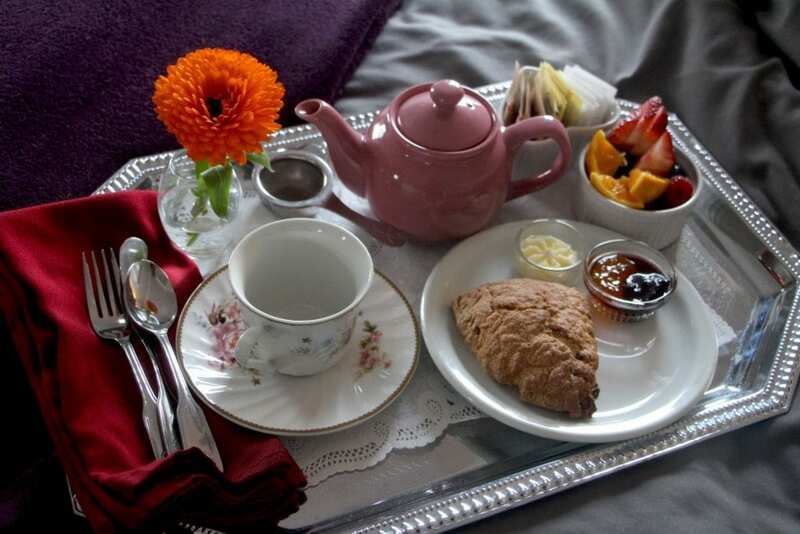 Note to my 8-year-old self on Mother’s Day: this is what breakfast in bed should have looked like. I crawled back under the silky-smooth sheets and warm comforter and pulled the tray beside me. 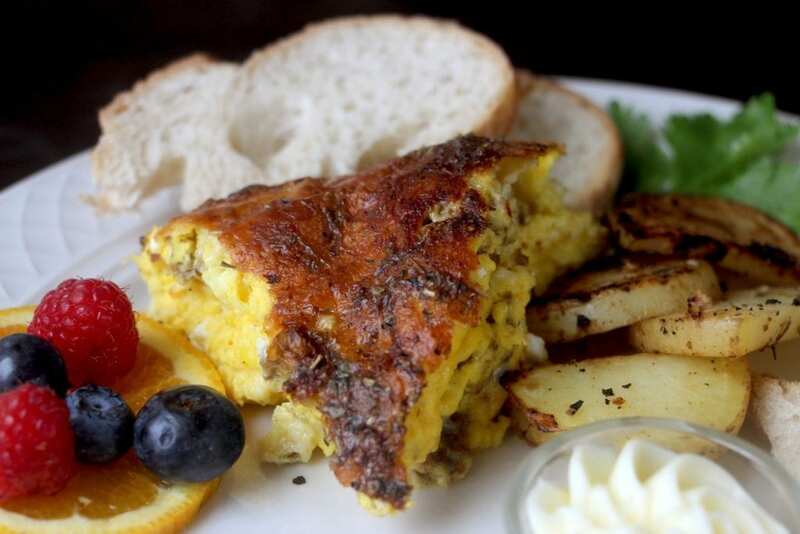 Act two of the Westport Hotel’s breakfast is served downstairs in the dining room with several options to choose from: a frittata, veggie omelet, yogurt fruit parfait, or oatmeal. I opted for the spicy Italian sausage frittata with roasted breakfast potatoes, sourdough toast, and fruit. It was all delicious and beautifully presented. With a clatter of voices and footsteps, the motorcyclists came downstairs for breakfast. Looking refreshed and recharged, they were packed and excited for the ride ahead of them. They dove into breakfast, exclaiming how wonderful everything was. Then they climbed onto their bikes, started up the engines, and rode north, the purr of the engines soon fading away. Then the silence rushed back in and settled over the town.